Made in Spain and developed by podiatrists, Footlogics Catwalk represents the ultimate in walking comfort! 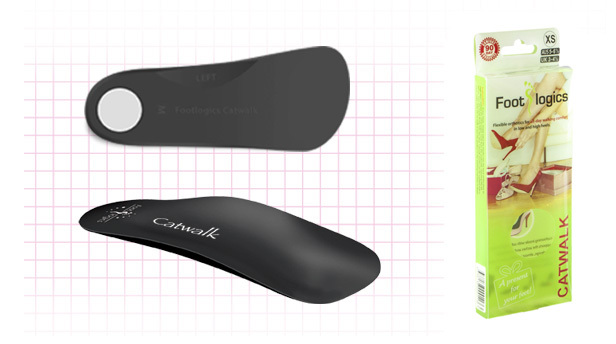 Catwalk orthotic insoles are flexible and fit in most types of women's fashion shoes, including pumps, court shoes, sandals or boots with low to medium heigh heel. Walking in heels means most of your body weight is placed on the front of your feet, causing the forefoot structure to collapse. This excess force and friction leads to common conditions like ball of foot pain, burning sensation under the foot (Metatarsalgia), callous and corns - even tired, aching legs! Catwalk insoles support the arch and forefoot and re-distribute your bodyweight. This greatly reduces the excess force on the forefoot, thereby providing lasting relief from pain and discomfort. These orthotic insoles are made of high-memory patented materials, designed to cushion and support at the same time, especially under the ball of the foot. An adhesive under the heel area prevents the insole from slipping forward inside your shoes, sandals or boots.